The AMD Ryzen Threadripper 2990WX (YD299XAZAFWOF) processor offers 32 high-performance cores that execute 64 simultaneous instruction streams at a base frequency of 3GHz and a maximum boost clock speed of 4.2GHz. With quad channel DDR4 memory support, the 2nd generation AMD Ryzen Threadripper CPU is the ideal processor for video and graphic-editing and other multitasking applications. AMD's state-of-the-art microarchitecture enables efficient multicore, multithread processing with its enhanced core engine, upgraded cache management, and lower power consumption. Have various programs running simultaneously and switch between them seamlessly without taxing our system. Machine intelligence implementation leads to faster clock speeds without sacrificing energy or thermal efficiency. AMD SenseMI technology automatically raises the clock speed for improved computing performance, smartly taking advantage of cooler temperatures and low energy consumption. An overclocking software with an intuitive graphical user interface is included, letting you conveniently create up to four overclocking profiles. 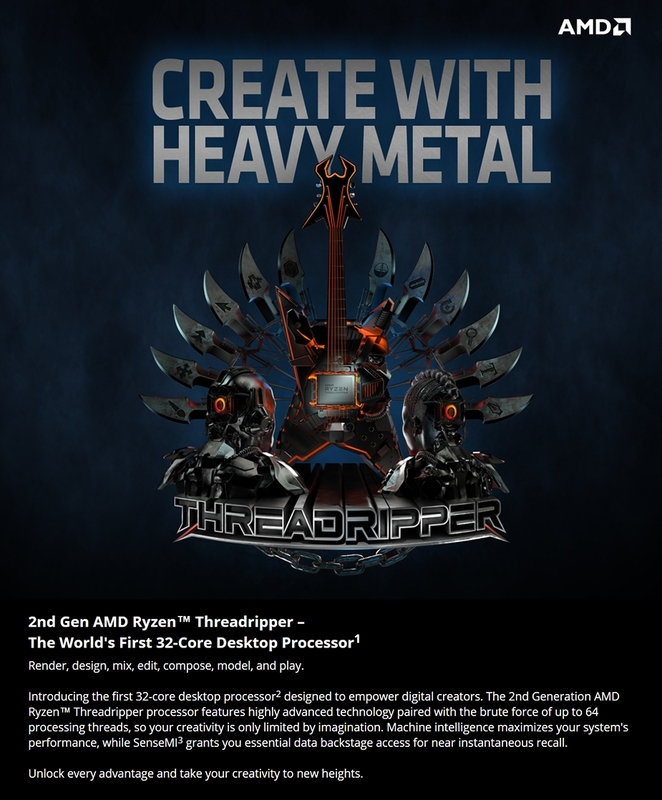 The AMD Ryzen Threadripper 2990WX processor lets you build a powerful desktop workstation for media creation and other computing-intensive use cases. Whether you are into film-making, game development, or enterprise application programming, the AMD Ryzen 2990WX Threadripper processor is fully capable of serving your needs, freeing you to be as creative as you can be. 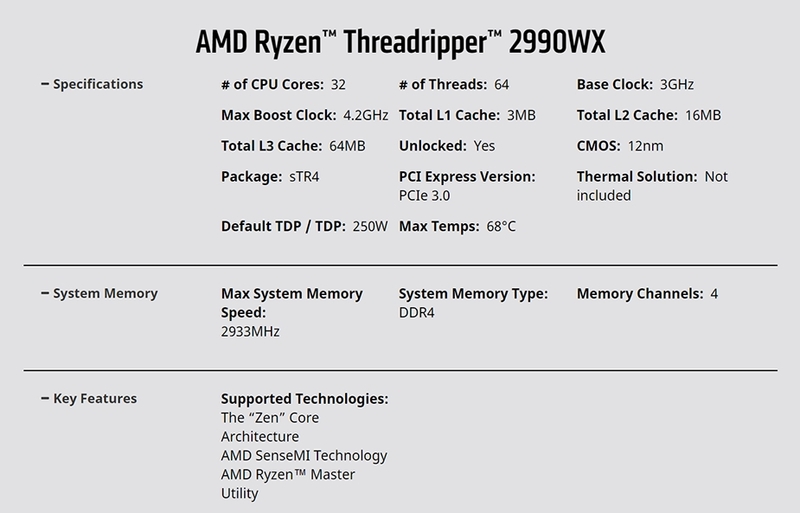 Read more about the AMD Ryzen Threadripper 2990WX CPU on AMD's site HERE.